George Jorgensen, Parrsboro’s auditor told Town Council last night that as of March 31, 2014, the town had more than $1.1 million in reserve funds thanks, in part, to $505-thousand in federal gas tax reserves. The gas tax is transferred to municipalities to help them build and maintain infrastructure such as roads and bridges or to finance programs such as sports and recreation. Jorgensen said the town is in good financial shape and the reserve money will likely be needed for upcoming projects. Under federal regulations, Parrsboro is required to invest in a sewage treatment plant that must be up and running by Dec. 31, 2020. The audit also showed that last year, the town spent more than $2.6 million, nearly $107 thousand more than it raised in revenue (see chart). 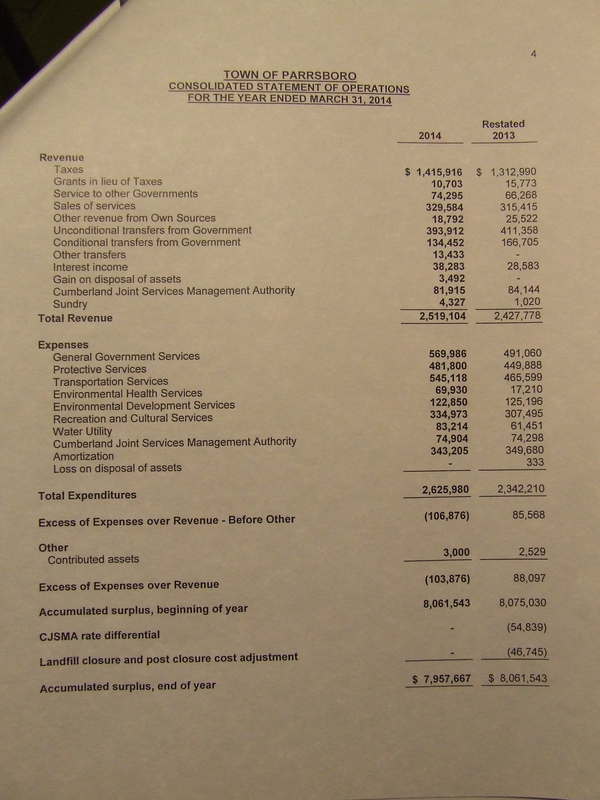 The audit shows that in the last fiscal year, the town spent $760,351 on salaries, wages and benefits, an increase of just over $46-thousand from the year before. The mayor received an honorarium of $9,952, while the four councillors were each paid $6,016. Town clerk Ray Hickey earned $73,397. This entry was posted in Town of Parrsboro and tagged audit, George Jorgensen. Bookmark the permalink.